Have you ever thought about making your ATV street legal? This seems to be becoming more popular and does have some good advantages. 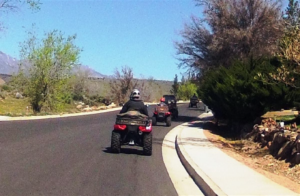 In this article “Utah ATV Street Legal Requirements” you will learn all you need to know to make your ATV street Legal. By being Street Legal you are allowed to operate your ATV on city streets, roads and highways that are allowed in the law. If you are mechanically inclined you can pick up a kit from your dealer or order one online. Just make sure that if you order online that you get all the required items as outlined below. If you are not mechanically inclined then I am sure your dealer will be happy to assist you. If you decide to make your ATV Street Legal there are a couple of things in addition to just paying your tax assessment each year you will need to do. First, you will need to have your ATV inspected every year. That is an additional cost. Second, you will have to make sure that items added to your ATV are well maintained and ready for inspection each year. This isn’t a real hard thing but something you need to remember to do. Insurance rates is another thing you will need to consider. Your monthly premium may change because you are now insuring it as a street legal vehicle. It could go up or it could go down. Mine went up $1.20 a month. Not a big deal. But every case is different. If you are interested in what this street legal stuff is all about I have included all the information you need to know below. I have also included link to HB0082 for 2017 that has some changes to the law this year, as well a link to the law. The big change is allowing street legal ATV use on the streets of Salt Lake County. However there is no street-legal ATV use on highways in Salt Lake County. That would include Mountain View Corridor and Bangerter Highway. This bill is an amendment to Utah Code 41-6a-1509. These changes go into effect on May 9, 2017. It’s important to understand the Law. We would strongly suggest that you are familiar with this law and these amendments. I hope you take the opportunity to get out a lot this season and enjoy this beautiful State that we live in and get some reprieve from the daily stress. Good luck and be safe out there. “All-terrain Type I Vehicle” means any motor vehicle 52 inches or less in width, having an unladen dry weight of 1,500 pounds or less, traveling on three or more low pressure tires, having a seat designed to be straddled by the operator, and designed for or capable of travel over unimproved terrain. “Utility Type Vehicle” means any recreational vehicle designed for and capable of travel over unimproved terrain: traveling on four or more tires, having a width of 30 to 70 inches, having an unladen dry weight of 2,200 pounds or less, having a seat height of 25 to 40 inches when measured at the forward edge of the seat bottom, and having side by side seating with a steering wheel for control. “Utility type vehicle” does not include an all-terrain type I vehicle, an all-terrain type II vehicle, a motorcycle or a snowmobile. A safety inspection must be completed before being registered for the first time, even if it is an exempt model year. After the first year of registration, the ATV must follow the current safety inspection frequency of every other year for the first eight years based off of the model year. After it is eight years old, it will be required to have a safety inspection every year. The safety inspection certificate, regardless if it is a paper or on-line certificate will have an ‘ATV’ watermark in the background. This watermark is present to assist the DMV with identifying the type of registration to process. Every Street-legal ATV is required to be registered in order to operate under this new law. Upon registration, the ATV owner will be issued a license plate the same size as are issued to motorcycles. Every ATV must be insured in order to operate as a street-legal ATV. The same insurance requirements that a “motor vehicle” must have also apply to Street-legal ATV’s. All-terrain vehicles may be inspected provided that they have been modified to be street legal. An all-terrain type I vehicle and utility type vehicle being operated as a street-legal ATV shall be equipped with the following items, which shall comply with the regulations of the department (41-6a-1509). One or more headlamps that meet the requirements of U.C.A. 41-6a-1603. A braking system, other than a parking brake, that meets the requirements ofU.C.A. 41-6a-1623. A horn or other warning device that meets the requirements of U.C.A. 41-6a- 1625. A muffler and emission control system that meets the requirements of U.C.A. 41- 6a-1626. Rear view mirrors on the right and left side of the driver in accordance withU.C.A. 41-6a-1627. A windshield, unless the operator wears eye protection while operating the vehicle. Vehicles designed by the manufacturer for carrying one or more passengers, a seat designed for passengers, including a footrest and handhold for each passenger. The highway authority with jurisdiction over the highway has designated a portion of a highway as closed to street-legal ATVs. 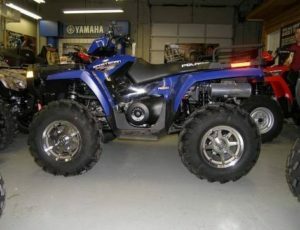 A Street-legal ATV is not authorized to be used in an area that is open to motor vehicle use. 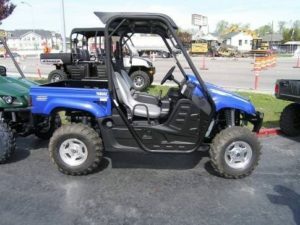 An all-terrain type I or Type II vehicle that meets the requirements of this section may be operated as a street-legal ATV on a street or highway that is a highway with one lane in each direction. An operator of a street-legal all-terrain vehicle, when operating a street-legal all-terrain vehicle on a highway in accordance with this section, may not exceed the lesser of the posted speed limit or 50 miles per hour. Shall equip the street-legal all-terrain vehicle with a reflector or reflective tape to the front and back of both sides of the vehicle.